Haitian President Michel Martelly has reached a deal with the senate and the chamber of deputies to avert a political crisis over long-delayed elections which sparked mass protests. Officials said Mr Martelly had signed an agreement with the presidents of the two chambers to extend their mandate. Lawmakers will now have to sign off on the deal. 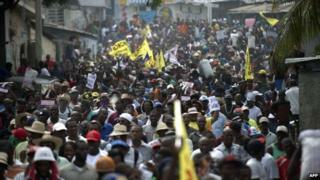 If it is not passed, Haiti could be left without a functioning government once the mandates expire on 12 January. Under the agreement, Haiti's deputies would be extended in their posts until 24 April and senators until 9 September. The deal comes just over two weeks after Prime Minister Laurent Lamothe resigned in the wake of violent protest at the delayed elections. Mid-term senate elections had been originally due in May 2012, while the municipal poll is three years behind schedule as Haiti slowly emerges from the earthquake which left much of the country devastated in 2010. They were postponed again on 26 October - the day they were due to be held - because of an ongoing stalemate between the government and a group of opposition senators over an electoral law. The repeated delays have triggered protests, some of them violent, by critics of the government, who accuse President Martelly of wanting to rule by decree. Mr Martelly has appointed Evans Paul, a former radio journalist, as the new prime minister. Mr Paul has to be confirmed by parliament before he can start forming a government.